“The book was fun: a clever and entertaining introduction to basic logical thinking and maths.” John Moffat Professor Emeritus in Physics University of Toronto “This ingenious and entertaining volume should be useful to anyone in the general public interested in self-help books; undergraduate students majoring in education or behavioral psychology; and graduates and researchers interested in problem-solving, creativity, and scientific research methodology.” Journal of Chemical Education This book describes how one can use The Scientific Method to solve everyday problems including medical ailments, health issues, money management, traveling, shopping, cooking, household chores, etc. It illustrates how to exploit the information collected from our five senses, how to solve problems when no information is available for the present problem situation, how to increase our chances of success by redefining a problem, and how to extrapolate our capabilities by seeing a relationship among heretofore unrelated concepts. One should formulate a hypothesis as early as possible in order to have a sense of direction regarding which path to follow. Occasionally, by making wild conjectures, creative solutions can transpire. However, hypotheses need to be well-tested. Through this way, The Scientific Method can help readers solve problems in both familiar and unfamiliar situations. Containing real-life examples of how various problems are solved - for instance, how some observant patients cure their own illnesses when medical experts have failed - this book will train readers to observe what others may have missed and conceive what others may not have contemplated. With practice, they will be able to solve more problems than they could previously imagine. 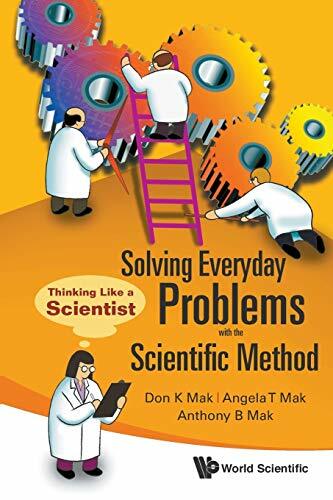 This book describes how one can use The Scientific Method to solve everyday problems including medical ailments, health issues, money management, traveling, shopping, cooking, household chores, etc. It illustrates how to exploit the information collected from our five senses, how to solve problems when no information is available for the present problem situation, how to increase our chances of success by redefining a problem, and how to extrapolate our capabilities by seeing a relationship among heretofore unrelated concepts. One should formulate a hypothesis as early as possible in order to have a sense of direction regarding which path to follow. Occasionally, by making wild conjectures, creative solutions can transpire. However, hypotheses need to be well-tested. Through this way, The Scientific Method can help readers solve problems in both familiar and unfamiliar situations. Containing real-life examples of how various problems are solved for instance, how some observant patients cure their own illnesses when medical experts have failed this book will train readers to observe what others may have missed and conceive what others may not have contemplated. With practice, they will be able to solve more problems than they could previously imagine.